Loved being with my husband Marcus and our sons, getting to work in two beauiful churches and beginning to write a mystery called Murder in the Kalahari. to leave you alone with your thoughts. flitting among the ancient Pine Boughs. that pick up on their own accord. and eons pass in a moment. or maybe an eternity you feel free. 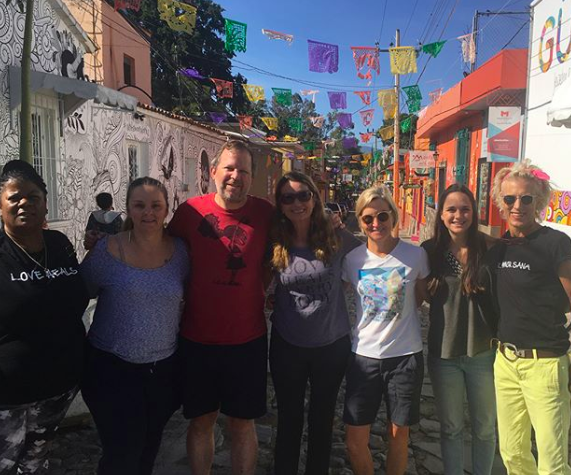 Thistle Farms Global went down to Mexico to help with strategic planning for our Shared Trade Partners, the Moringa Madres. Helping start justice initiatives is hard and slow work. It takes a community not easily discouraged and willing to be humbled by small scale. We had that team, and so it was possible to dream. While I have been away Thistle Farms has been flourishing. I got some updates this week including that the national network has grown 23% over the past six months and now has 27 homes serving women survivors in 19 different states. I also learned that sales of The Welcome Project mats woven by Syrian refugees (#lovewelcomes) remain strong. They came in at #5 on Thislte Farms best selling products for July. ...I am now off to the plateau of Sewanee to speak at the Monteagle Sunday School Assembly and then on to a retreat center in Massachusetts. I will be teaching for 4 days at the Society of Companions Conference about "How Love Is the Most Powerful Force for Change in the World." Thank you for helping make so many of our midsummer daydreams come to life.